As the debate continues over how to address the surge of Central American migrants arriving at the U.S.-Mexico border, the appropriations committee of the U.S. House of Representatives on Thursday set aside $595 million in aid for those countries. 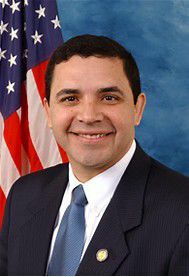 The funds, included in the State, Foreign Operations, and Related Programs Appropriations bill for fiscal year 2019, will go toward addressing the “root cause of migration” to the United States, according to a news release issued Friday by U.S. Rep. Henry Cuellar, D-Laredo. However, $750 million of those funds have still not been disbursed to them by the U.S. State Department which Cuellar said he believed was due to bureaucracy. “That’s what’s a little frustrating because they know what’s happening on the border and in my opinion, they’re not moving fast enough on that,” he said. Therefore the bill for 2019 included language directing the state department to send the funds “as soon as possible,” Cuellar said. Specifically, it directs the state department to submit its spending plan and to take steps to ensure that Central America receives the funds within 60 days of the bill’s enactment. The funds would be used mainly for economic development but also for crime fighting and police training equipment and some military aid. “The most important thing is the violence because that’s what’s driving some of the people from those countries over here,” Cuellar said. Earlier this week, the congressman expressed support for another possible measure to address the arrival of migrants during a news conference held Monday in McAllen known as a Safe Third Country agreement. Such an agreement currently exists between the United States and Canada and would require asylum seekers to request refugee protection in the first safe country they arrive in. If the U.S. were to enter into that type of agreement with Mexico, as Cuellar supports, asylum-seeking migrants would essentially be forced to first request help from Mexico. As for how confident he is that those funds, should they be disbursed to those countries, help curb migration, Cuellar said he was hopeful. “If we can help at least address the poverty in those countries and help address the crime then hopefully there’ll be (fewer) reasons for those people to leave,” he said.